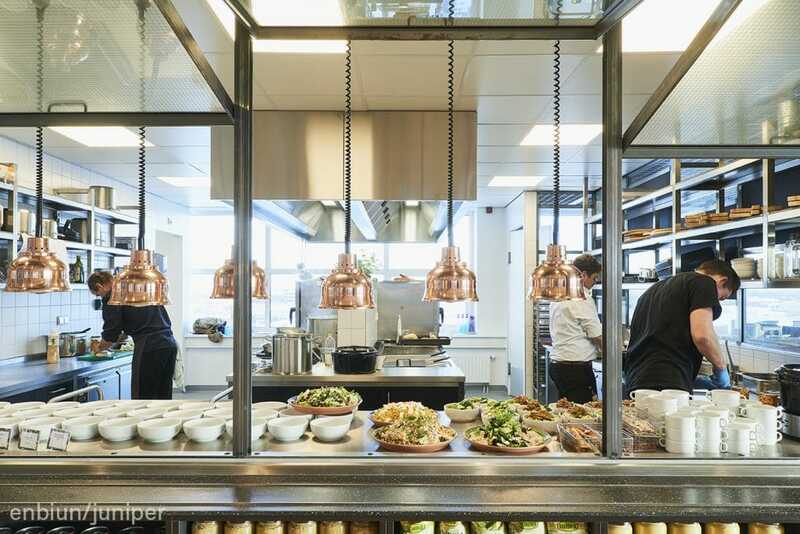 A year after the opening of the Juniper international kitchen, the restaurant & workplace are fully up and running. 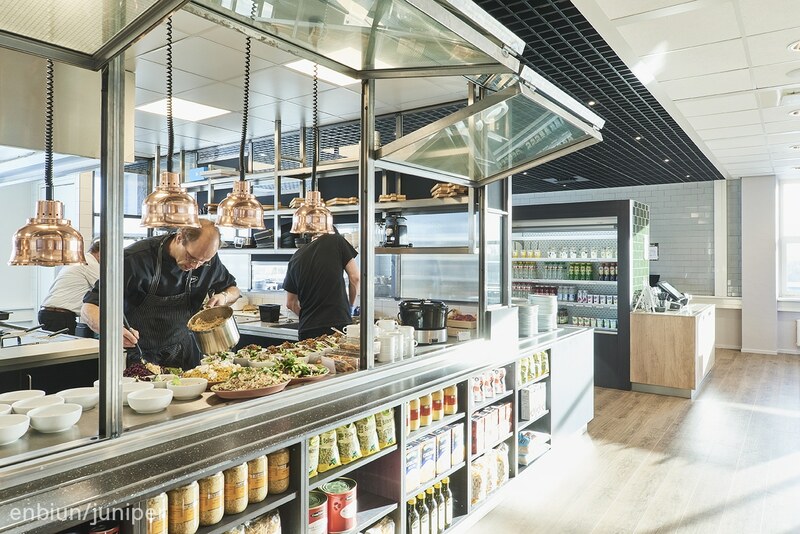 The area was designed to be a multifunctional space on the entrée level of the Juniper office and is open to the employees and selected public. The main area is a bar and kitchen. Where fresh food is served all day long. Next to that the focus point was to manage a larger quantity of people at the same time. So no queues during lunch hours. 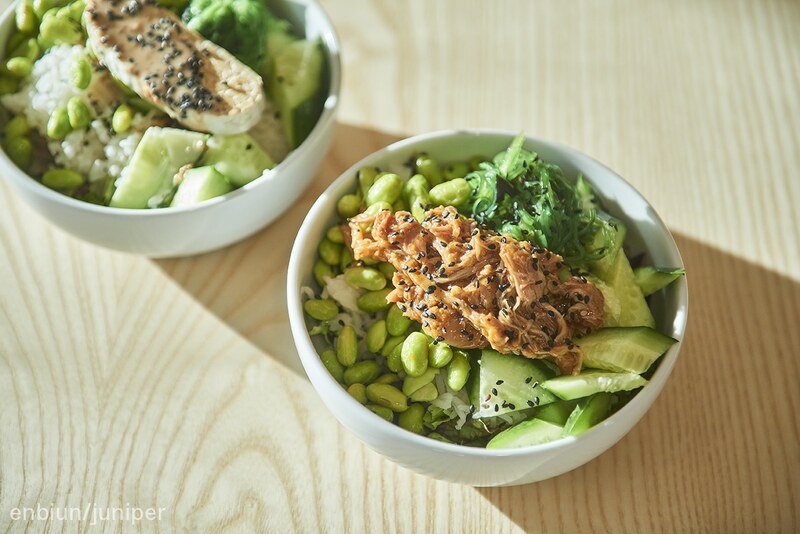 The restaurants uses 5 different tricks that create a fast flow through the restaurant with an offer of healthy food that services all international preferences. Within the international workforce of Juniper, all guests have their own taste and diet restrictions. 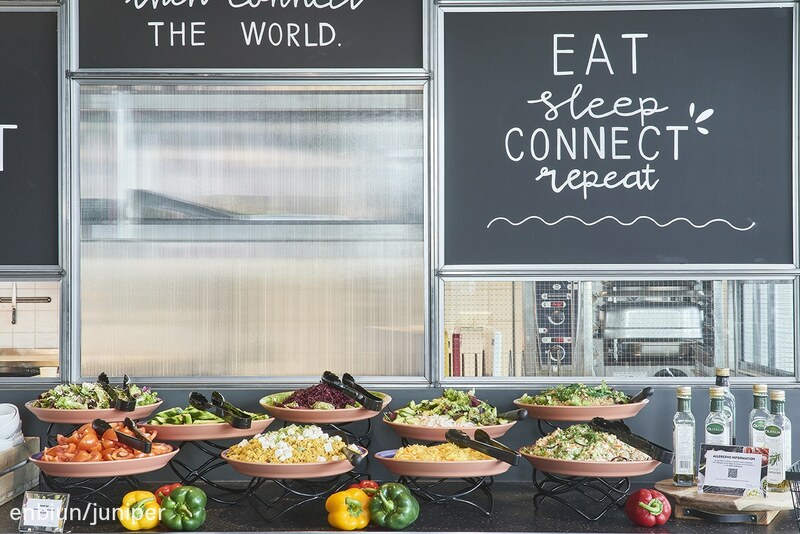 The salad bar is designed for a guest to customize their own salad out of 3 bases and 6 different toppings. Next to that there will be 3 different kinds of fresh sandwiches. From Monday till Thursday there is a variety of home made soups and meals. Different meals are served in time slots every day. To accomodate all diet restrictions there is a meat and fish option as well as a hallal and a vegetarian/ vegan option. For lighter meals there is a convenience cooler with yoghurts, fruit smoothies and slices of bread and traditional Dutch toppings. There is a basis of an oatmeal and egg menu that will be served during the day. So when guests miss lunchtime there is always something to eat. Besides this there are healthy snacks on offer to keep going. A personal familiar touch is key. So the team who work there daily is always the same. And therefore they can add their own touch to the menu's. The patisserie make their own candy and salt snack around 15:00 using delicious family recipes. This creates a very warm atmosphere and gives this extra hospitality experience where guests feel appreciated and taken care of. Everyone in an office needs one guilty pleasure day. At Juniper they close of the week with a bang. So the healthy policy skipped a bit and an extra hamburger menu and a pancake option is on offer. Cooked from fresh ingredients and definitely something to look forward to. The restaurant lay-out is divided in separate areas that consist of the same categories of food every day. Where the menu contents change it still creates easy wayfinding and therefore a large quantity of people can be managed. The restaurant has self-service register which are easy to use and it results in a good flow in the building to avoid queues. As a conclusion we can say that the concept for Juniper is well used, appreciated and really gives the guests a great hospitality and service experience. Happy guests for a year are the best proof for this!